Once this young Netch calf imprints on a master, it will follow him or her anywhere, floating along and tootling happily. 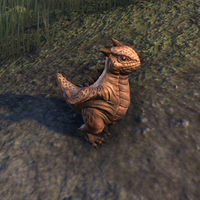 A baby netch pet is available from the Crown Store for 00700700 , and in the Wild Hunt Crown Crates as an Epic-level reward. Its default name is "Bulgy". Most Echalettes are docile and fawn-like, but not the Badger Ruff breed, which are strangely fierce and irritable. They're so ornery they've been known to chase away inquisitive Sabre Cats. 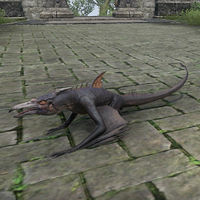 Badger Ruff Echalette was available from the Crown Store during the end of the month of March, 2019, for 00900900 . Its default name is "Feisty". Who says a giant, aggressive, blood-sucking insect can't make a loveable pet? Not the Dark Elves of Bal Foyen, who breed them as trackers, watch-hounds, and netch-deflators. A Bal Foyen nix hound pet was available from the Crown Store for 00400400 , and can also be found in Dwarven Crown Crates as a Superior-level reward. Its default name is "Skeeter". Though unwilling to fight, this Daedric minion will follow you loyally—for now. 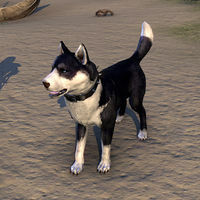 Banekin pets are available from the Crown Store for 700 , and in the Wild Hunt Crown Crates as a Superior-level reward. Its default name is "Ornery". 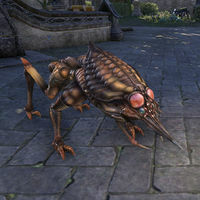 According to the calculations of the sages of the Cult of the Ancestor Moth, the bantam guar is the cutest creature in all Tamriel. 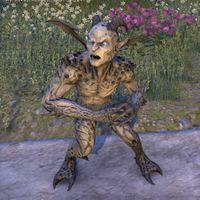 Bantam guar pets were originally available from the Crown Store for 400 , but can now only be obtained as part of the Adventurer Pack. Its default name is "Squee", changed from "Squeee" in Patch 2.0.5 due to contradicting the existing naming conventions of player characters. The Bear-Lizard Cub is an upcoming mount. Its default name is "Scaly-Boo". The Big-Eared Ginger, a favorite shipboard pet, is just about the most playful kitten in Summerset. Its over-sized sound catchers enable it to hear every tiny motion within range before it pounces upon it. The Big-Eared Ginger Kitten is a pet acquired by collecting seven runebox fragments in Karnwasten, Summerset. Its default name is "Batkitty". 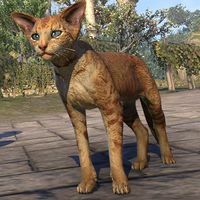 The Ginger Mouser is a favorite barn cat of grain farmers all across central Tamriel, not just because it keeps the storage bins rodent-free, but also for its affectionate personality and goofy good looks. The Big-Eared Ginger Mouser is a pet available in the Scalecaller Crown Crates as a Legendary-level reward. Its default name is "Mouse Murderer". 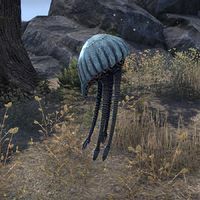 Thetys Ramarys of Balmora says, "I love our Bitter Coast Striders, but feel bad that they can't fly very well. So I'm selectively breeding them into a strain that, one day, will dominate the Vvardenfell skies, pursuing its prey for great distances! The Bitter Coast Cliff Strider is a young Cliff Strider that is available in the Crown Store for 00700700 . Its default name is "Shrieky". The Black Bear Cub is both playful and affectionate, and is so adorable it's quickly forgiven for whatever trouble it gets into. Black Bear Cubs were originally available from the Crown Store for 1000 , and later appeared in the Reaper's Harvest Crown Crates as a Legendary-level reward. Its default name is "Roly-Poly". This black cat knows things you cannot know, and sees things you cannot see. But that is the nature of all black cats, is it not? 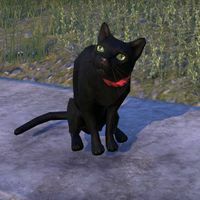 Black cat pets were made available as part of a regional promotion on amazon.co.jp for those who purchased the Japanese digital version of the game, and were later made available in the Crown Store for a limited time for 00700700 . Its default name is "Salem". This variant of the Bear-Dog is a favorite of the Markarth Watch - and of the thieves who attempt to evade them. The Watch uses them to sniff out trouble, while the outlaws employ them to keep an eye out for the Watch! The Black Mask Bear-Dog is available as a Legendary-level reward in the Storm Atronach Crown Crate. Its default name is "Nightbiter". Bull Mastiffs from Morthal in Skyrim are fearless and tireless hunters inured to the hardships of the frozen marshes. The black ones are particularly popular with mages and alchemists. The Black Morthal Mastiff is a Superior-level reward available from Psijic Vault Crown Crates. Its default name is "Blaggi". "Rajhin the Purring Liar had so many shadows that some of them took on lives of their own, becoming Black Senche-Panthers who stalk freely through Elsweyr -- just like this kitten that plays with my tail. 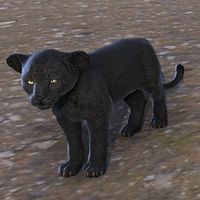 --Clan-Mother Ahnissi"
The Black Senche-Panther Kitten is a pet available in the Wild Hunt Crown Crates as a Legendary-level reward. Its default name is "Keirgo". This busy little buddy is sometimes mistaken for an imgakin monkey. 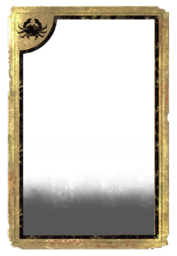 The Blackwood Monkey is an upcoming pet that has yet to become available, though has been in the game files ever since at least Patch 2.1.0. Its default name is "Flinger". For the Dark Elves, the Shroom Shalk is a companion animal that brings calm and serenity to the Dunmeri home. There's just something so soothing about the way the blue fungal sprouts on its back gently wave and puff out spores as the beast putters about. 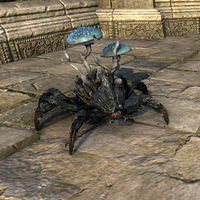 The Blue-Cap Shroom Shalk was available in the Dwarven Crown Crates as an Epic-level reward. Its default name is "Sporebug". 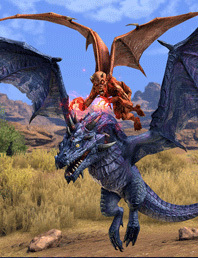 The Blue Dragon Imp will be distributed to those that pre-purchased any version of the Elsweyr chapter, and will be available at its launch. 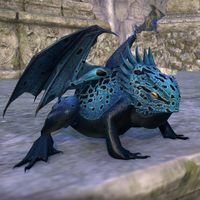 The comical Blue Oasis Dragon Frog is native to Hew's Bane, and before they were bred as pets could be found only on that Hammerfell peninsula. These little bug-eaters are popular mascots at open-air taverns. The Blue Oasis Dragon Frog was available from the Crown Store for 00700700 , and in the Wild Hunt Crown Crates as a Legendary-level reward. Its default name is "Topaz". The rare and colorful Shock Nixad looks rather like a tiny, winged Storm Atronach, though without the whirling electric rocks. They make loyal companions—though they may also make your hair stand on end! The Blue Shock Nixad is an upcoming pet. Its default name is "Joltie". When the gray wolves of Rivenspire howl across the dismal moors of Boralis, it sends a chill down the spine and even the bravest look back over their shoulders—but by Kynareth, their pups sure are cute! And adorably playful into the bargain. 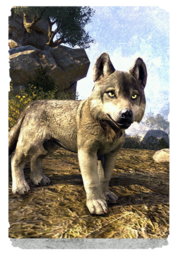 The Boralis Gray Wolf Pup is an upcoming pet that has yet to become obtainable. Its default name is "Darla". 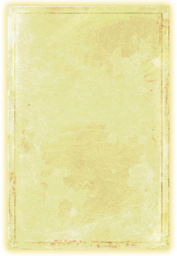 The Brassilisk is an upcoming pet that has yet to be available. Its default name is "Coppertongue". The Bravil Retriever loves the water, and is a favorite hunter's companion from Anvil to Gideon. 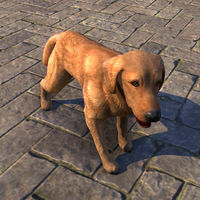 Bravil Retrievers are gold-colored dog pets available from the Crown Store for 400 , and in the Wild Hunt Crown Crates as a Superior-level reward. Its default name is "Dogdroth". The legend among the underworld explorers of the Undaunted is that these little incendiary spires are responsible for lighting all the candles, torches, and lanterns found burning underground, flying ahead of adventurers to ignite them in the dark. Brimstone Nixads are a fire themed nixad pets available for a limted time in the Crown Store for '1080 . Its default name is "Torchy". 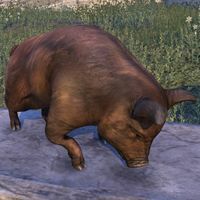 This cross between a domestic pig and a Skyrim boar is as loyal as it is adorable. Bristlegut Piglets were given out at conventions and as part of official competitions and giveaways in 2014. It was also included as part of the Humble Monthly Promotion in 2017. Its default name is "Muddles". It may be hard to believe, but the ancient Nords were even more warlike than modern Nords, and had a way of weaponizing everything that came to hand, even their livestock. This was the origin of that most obstreperous of porkers, the Bristleneck War Boar. 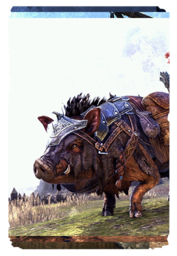 The Bristleneck War Boar is an upcoming pet that has yet to become available. Its default name is "Gruntly". The Butterscotch Dragon Frog is available from the Xanmeer Crown Crates as an Epic-level reward. Its default name is "Bug-Biter". This page was last modified on 2 April 2019, at 02:17.